This isn't really about the moon, I call it a moonblog because a new homepage image appears twice a month on the new and full moon. The home page shows a featured image —sometimes freshly minted, sometimes seasonal, sometimes from years past— along with improvised ruminations. Previous years' entries are here for your perusal, something like a leisurely blog. See the links, above. 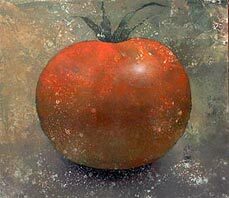 This tomato painting is a few years old. I think it sold at a fundraising auction for the Boulder Museum of Contemporary Art in Colorado, USA. I don't usually attend auctions where my work is on the block; it's too nerve-wracking. There is always the possibility that no one will bid, or that the bidding will be so meager that, you know, it'll be a public embarrassment. The Buddhist tradition talks about how to avoid being trapped by The Eight Worldly Concerns, things like Praise and Blame, Fame and Obscurity, and so on. The absence of such worries is equivalent to a life of contentment. Easier said than done. Flakily enough I can't remember the size of this painting but I'm guessing that it's 26″x 28″. It's acrylic on canvas. By the way, the painting did sell after some brisk bidding, and at a decent price, but nothing that made it into the New York Times. 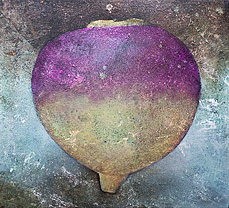 This is a small acrylic painting of a turnip; it's 22″x 20″. At the time of this writing it is hanging in the Art & Soul Gallery in Boulder, Colorado as part of their tenth anniversary exhibition. (I'm not that crazy about turnips as a food, although you can make a winning pasta dish with sautéed, minced turnip and onions: after you sauté them until tender, serve over pasta or egg noodles with goat cheese and pine nuts. You'll be glad you did.) This painting is an example of something that I wish would happen more often when I'm working: a very particular pace of execution accompanied by an economic yet flexible sense of knowing how to proceed. The British artist Bridget Riley talks about a painting's “picture plane” as a discoverable, locatable experience which, she says, every painter recognizes when she finds it. I equate her description with what I'm trying to convey here. It's more an encounter than an accomplishment; more like grace than skill. This painting is 28″ x 32″, acrylic on canvas; it will be in the upcoming tenth anniversary celebration for Art & Soul Gallery. During the latter part of the 1990s I did a series of triptychs by putting together existing paintings done at different times. I would test drive various combinations, sometimes leaving them up on my studio wall for days or weeks. Many of the trial combinations ended up suffering from irreconcilable differences and had to be separated. This particular ménage a trois survived and, to my eye, still holds up twelve years later. Perhaps the Greek notion of aporia —a conceptual gap that resists being pinned down — is the guiding principle here: the images are ordinary and recognizable enough; but what are they doing together? The yellow leaf is from a narrowleaf cottonwood tree, the bowl of water and tin can are a still life painted “live”, the wasp is copied from Katsushika Hokusai's famous series of drawing manuals. This triptych is 26″x 84″ overall; it's acrylic on canvas. This is number seven in a series of nearly one hundred paintings of the sun. 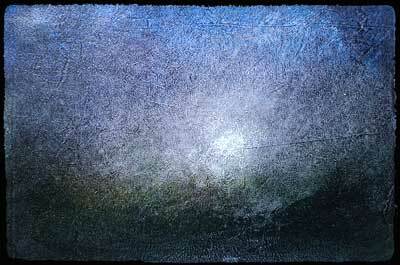 Somehow right now in October on the night of the full moon this painting looks more like a moon than a sun. These are small paintings – 8½″ x 14¾″ – acrylic and gesso on unstretched cotton muslin. The rough edges and rumpled surface suggest pictures that have weathered a few centuries of bad storage and human folly. (I suppose the very activity of painting could itself be a category of human folly.) In fact, this series occurred in a burst of activity earlier this year; you can see more of them right here. < I have been drawing and painting pears since the early 1970s; this has made me a figure of fun among some callous aesthetes. 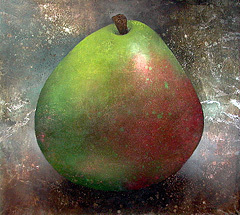 This is a painting of a ripe D'Anjou pear; it's acrylic on canvas, measuring 38″x 42″. Here's what Wikipedia says about this kind of pear: “The D'Anjou pear, sometimes referred to as the Beurré d'Anjou or simply Anjou, is a short-necked cultivar of European Pear. The variety was originally named Nec Plus Meuris in Europe and the name Anjou or d'Anjou was erroneously applied to the variety when introduced to America and England. It is thought to have originated in the early to mid-19th century, in Belgium or France.” I believe you can see this painting in person at the new Zucca restaurant in Louisville, Colorado while having a fine meal. 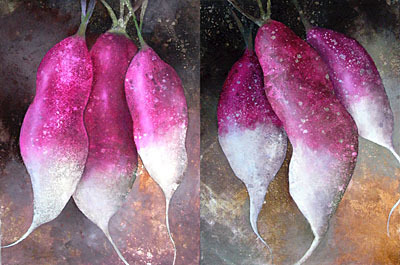 Some years ago I started making diptychs of fruit and vegetables. 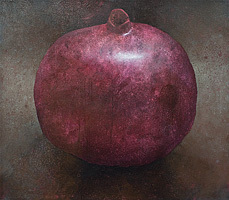 This one of wild crab apples is acrylic on canvas and it measures 40″x 60″ overall. Crabapples seem to grow everywhere. There are thousands of varieties, many of them quite beautiful and many of them quite inedible. These came from a small and I would have to say scrawny tree growing unloved along Arapahoe Avenue in Boulder, Colorado. I don't know what it is about arranging things in pairs this way that seems to hold my interest. I've done it with eggplants, apples, squash, and many other things. It's the height of peach season in Colorado. Most people from elsewhere are surprised to discover that we have some of the best peaches in this part of the solar system. 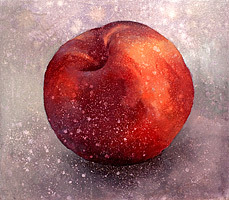 I don't have any explanation for painting fruit other than admiration—maybe “wonder” would be a better word. Sometimes when I eat a piece of fruit that I have painted I feel that I'm eating my young. This painting is acrylic on canvas; it's 28″x 32″. 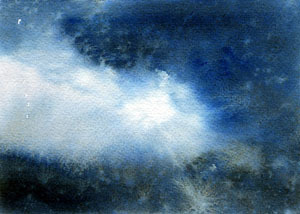 This small watercolor is part of an exercise that I do in my classes at Naropa. I call the exercise “Proliferation”. The assignment is to complete fifty watercolors in one three-hour class session. This takes some planning beforehand and everyone is encouraged to arrive with materials, a theme, and any visual references ready to go. Coffee and chocolate are encouraged. Over the course of three hours most people find that the project starts leading with its own momentum. You also have to be willing to let go of the inevitable wrecks that occur, not succumbing to the temptation to fix everything. This is hard on the control freak that lives in each one of us. The painting here is loosely based on photographic images from Ireland; it's 4½″x 6½″. I have experimented with grids since being introduced to them in a fifth grade art class. 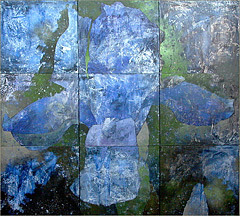 This painting, with the prosaic title Blue Iris, is a continuation of that interest. I deliberately paint these one panel at a time manually and without using any kind of optical projection, allowing for naturally occurring discrepancies along the seams. The series also shows an affinity for a nine-panel arrangement popular with mystical diagrams, hand made quilts, and tic-tac-toe. It's acrylic on canvas, 54″x 60″. These two paintings were done as a pair. I call them Una's Radishes. My friend Una is an avid gardener and bee keeper (in addition to being a film maker and writer). She gives us some of the bounty from her garden. One day she delivered a bag of these radishes, right out of the ground. This was a good example of something giving the idea for a painting right on the spot. And the radishes were spicy and delicious. As a diptych, this one measures 60″w x 40″h; it's acrylic on canvas. 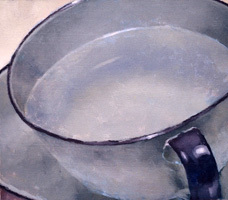 These are two paintings of the same pewter pitcher, which I intended to be a diptych as shown here. They do also work just fine individually and that is what happened to them. They were purchased by different people and now live like separated twins unaware of each other's whereabouts. I've experimented off and on with this identical twin format over the years. I suppose I should stick to my guns and keep them together. I probably let my gallery talk me into breaking up the set because they had buyers and I got greedy for the cash. 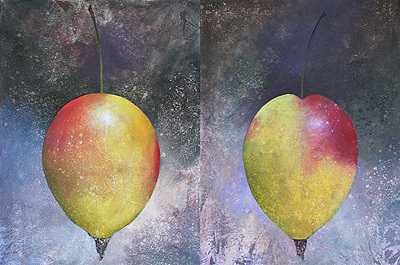 As a diptych, this one measures 28″x 64″; it's acrylic on canvas. This painting – Hokusai, Glass Bowl, Snail – is part of a series of experiments from the late 1990s, triptychs composed from images that had no apparent association, yet together conveyed inexplicable wholeness or rightness. (Who decides this? and by what criteria?) The process, which involved a great deal of trial and error over a period of many months, was akin to slow motion improvisational cooking, combining flavors and ingredients while guided by regular, considered tasting. If a series held up under this scrutiny, I would attach them as a triptych. The images of each panel were painted in separate circumstances and derive from both observed and copied sources: The hands in the left panel are a detail from Katsushika Hokusai's drawing manuals; the glass bowl and can are from an ongoing channeling of Paul Cezanne, and the snail shell is from a collection of shells in the studio. There are several other triptychs from this series in the latter part of the Large Work section of the website. 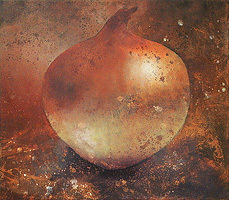 I call this painting Sandrock's Onion. It was featured during one of Boulder, Colorado's “Open Studios” tours sometime around 2004 or 2005. The painting is 28″ x 32″, acrylic on canvas. I've painted a number of onions over the years. I think this one is my favorite of all of them. A man named Kevin Sandrock purchased the painting during the studios tour. He was living in Wisconsin at the time and during those years he would show up for the Open Studios tour with a large entourage of his extended family. His brother lives in Boulder and I run into him from time to time. I sometimes name paintings after the people who own them; somehow the name Sandrock's Onion is more interesting than, say, Onion #34. This painting, Grey Cup, was part of a series from the mid 1990s, all of which were acrylic on canvas and 26″ x 28″. The inspiration was a simple, enameled tin cup from the 1920s that had belonged to my wife's grandmother, Bess Hamilton Anderson. These cups and saucers were mass produced in a variety of colors always trimmed in black. I tried numerous invented color schemes for them and frequently showed them holding clear water, probably because of the subtle changes in refracted light. Some time in the next few months I'll be adding a section of paintings from this period and you'll see more of these. 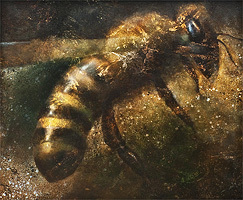 This painting is called Night Bee III. It's acrylic on canvas, 52″ x 60". The theme of bees came, as many ideas do, unexpectedly and seemingly out of nowhere. Watching bees more closely a few summers ago, I noticed a striking combination of diligence and tolerance as they moved from flower to flower. If a flower was occupied by another insect, the approaching bee would simply go elsewhere. It is well known that bees have been in trouble in recent years; their numbers have declined for a variety of reasons - some known and some mysterious. Another name for this series might be “Ghost Bees”.